The J.N. "Ding" Darling Wildlife Refuge is known worldwide for its mangrove ecosystem and its incredible migratory bird population. It's also an easy way for visitors to enjoy nature and learn about our wildlife through our educational Visitor's Center. Driving and walking trails through the Refuge allow people to get close to our island wildlife. Wildlife drive is a five-mile loop road that takes you through the 6,400 acre preserve. Over 220 species of birds call the sanctuary home and low tide is the best time to watch them feed and play in the shallow salt water and fresh water flats. At the entrance to the Refuge there is the Visitor's Center where you can explore the in-depth workings of our mangrove ecosystem. There is also a hands-on area for kids! To tour the preserve you can sign up for a narrated tram tour, or you can walk, bike or take your own car. Besides Wildlife Drive, there is the four-mile Indigo Trail, the quarter-mile Wulfert Keys Trail and the quarter-mile Shell Mound Trail. You can also tour by canoe or kayak! Just be sure to remember your camera. Fishing is allowed and you can relax while fishing for snook, redfish, sheepshead or sea trout. The Visitor's Center can fill you in on what's in season and where to fish. Boating is also allowed in designated areas of the Refuge. In 1967 the sanctuary was renamed for the political cartoonist Jay Norwood "Ding" Darling. 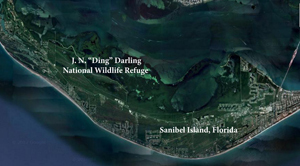 Ding was an avid conservationist and in 1945 he was instrumental in having President Harry Truman sign an Executive order creating the Sanibel National Wildlife Refuge. Currently approximately 2,800 acres are designated by Congress as a Wilderness Area. The Refuge offers much more than I can mention in this blog, and you can find more information at this Website. You can also visit my new webpage and check out my video of the Refuge. You can see roseate spoonbills along with egrets and herons feeding on the flats. You can check out the video Here! I hope you remember to make time for a visit to the Refuge on your next island visit, but until then, please give me a call at 239-691-4915, or use my contact form for all the latest information about my special islands! Miles and miles of beach, our historic lighthouse, condos, homes and vacant land - this is the year for you to explore Sanibel and Captiva real estate!